My experiences in Africa have gained me insight to a world I’d never known, a world I hadn’t expected. Never did I intend to encounter a militant organization with ties to an anarchist who would do anything to overthrow a nation for personal gain, destroying his own people. Had I not seen it with my own eyes, I would never have believed there were men in our present world so filled with this present darkness that they would kill a man for pleasure, cut off an arm for punishment, or plot against an entire civilization for the sake of power. I know that history is filled with such men. But I’d hoped that the mistakes of our past would have changed our future. Unfortunately, this is not the case. The Ghost of Africa explores what could happen in a “what if” scenario when those in power are separated from their moral compasses by greed, allowing them to expand their influence to the point where it touches everyone. No one is safe. I have been blessed to study the art of writing under Steven James and Robert Dugoni, two of the most talented writers I have ever known and been privileged to read. I’ve learned more from them than I can express. If you want an incredible adventure, read their books—they’re on the cutting edge of perfection for thriller, adventure, mystery fiction authors. In honor of the launch of The Ghost of Africa, I’d like to give applause to the man whose writing and encouragement has had a profound impact on my own writing. One could say that every fiction writer’s path to publication is a little crooked, often an uphill battle. A huge “thank you” to Steven James for supporting me along the way, and to Pam who helped iron out the jagged edges. Will you help me celebrate? 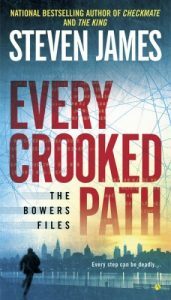 Grab a copy of my favorite Steven James novel, Every Crooked Path http://amzn.to/1Qw4a9h. And in honor of the Ghost of Africa’s launch, I’m giving away a $100 Amazon gift card. Come follow my FB author page for instructions and a chance to win https://www.facebook.com/officialdonbrobst. 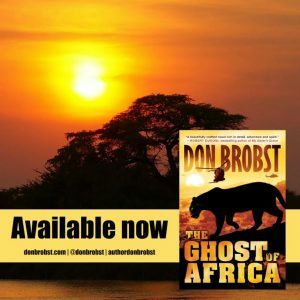 Previous: The Ghost of Africa Releases Today!